Thank you for your interest in donating your gently used clothes, shoes, and household items to the Multiple Sclerosis Association of America (MSAA). 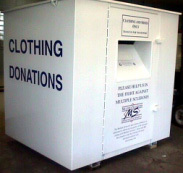 Your donation not only helps free up your closet space, it allows your donations to be recycled and reused by others, and provides a critical source of funding for our vital services and support which help us improve lives today for the MS community. In Pennsylvania and New Jersey only, more than 100 bins are located throughout the Delaware Valley area and beyond. These bins are used to recycle clothing, shoes, handbags, and anything made of cloth or leather. To find a bin near you, please contact MSAA Donor Relations at DonorRelations@mymsaa.org.